This year, the curation of the 14th Lyon Biennale, cofounded in 1991 by Thierry Raspail (director of the Museum of Contemporary Art of Lyon) was handed over to the art historian and director of the Centre Pompidou-Metz Emma Lavigne. Second episode of a trilogy articulated around the “modern” word, it is dedicated to the “Floating Worlds”. 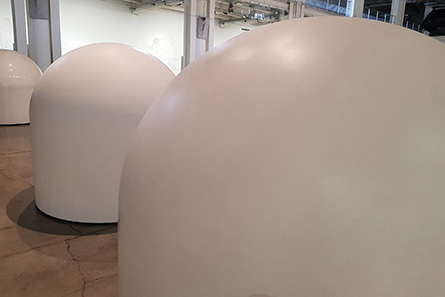 During the Lyon Biennale, there is a geodesic dome Place Antoine Poncelet. The dome was created in 1957 by architect Buckminster Fuller, although it seems to have been conceived to host Céleste Boursier-Mougenot’s “Clinamen” sound installation. Because the shallow pool perfectly fits the shape of the “Radôme”. The sounds whirl and our comments get lost. Our eyes scrutinize the water surface in order to seize the bowls bumping into one another. 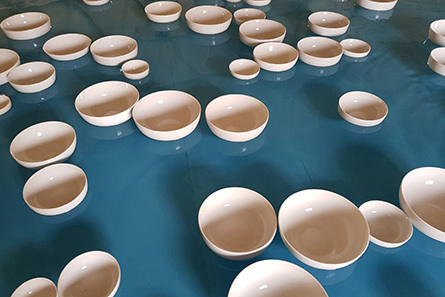 The music of randomness is none other than the result of the artist’s control; in addition, so is the water temperature and the current that makes the pieces of porcelain move. They have been selected one after the other for the sounds that they hold and that the apparatus releases. The bowls are so alike that our eyes are not able to focus, and our gaze is set free from the control of our thought. It is our attention that is floating, and following the rhythm of the sounds that come out of all gravity in this place, reminding us of the protective shelters of antennas that we usually deem unattainable. At the entry of the Sucrière, we are welcomed by the sculptures with imperceptible movements that Robert Breer imagined at the end of the 1960s: the “Float”. In 1970, they had already been performed in the surroundings of the American pavilion at the universal Exhibition of Osaka. Emerging from the cloud sculpted by Fujiko Nakaya, they were used to moving around freely. With minimalist forms and kinetic behaviors, they also evoke cybernetics due to their autonomy. In Osaka as well as in Lyon, a few decades apart, they live their own “life” and it is up to the audience to adapt to their extreme slowness for those who are able to discern their movements. Their names tell us that they are suspended just like aerial choreography dancers. Being in the age of machine learning, we imagine them mapping the ground of the Sucrière without ever knowing if they could consider escaping. Demonstrating their complete freedom, they stay at the place of their daily performance like pet robots tied to the humans that take care of them. Hans Haacke is an artist of systems that has reactivated a work of 1967 in Lyon. Fifty years have gone by and the time has not affected this apparatus, as timeless as it is. 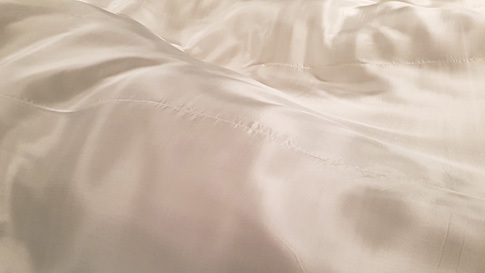 We all have one day gazed at the effect of the wind on a fabric, a sheet or a veil. 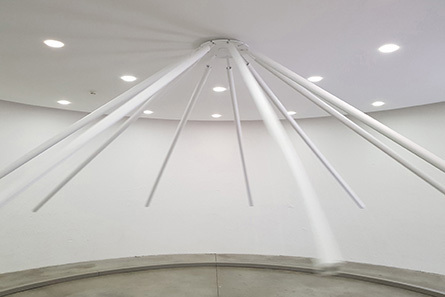 The German artist contended himself with recreating this situation in a museum, giving it the title “Wide White Flow”. At the center of the Sucrière, he has placed a very large white silk rectangle that he meticulously “fixed” to the architecture on its angles. Having placed some fans at one end of it, it animates itself with a moving airflow. Consequently, it is not the fabric that we are observing, but rather the invisible that, literally, gives life to it. Such as the traveler painted from the back by another German artist of another time, Caspar David Friedrich, here we are at the top of a sea of clouds. The white expanse, which we face, does not tell us anything about itself. And it is when our gaze is lost in its surface that we dread the flows that animate us from the inside. Who has never swung a tube in space in order to extract unexpected sounds? From this experience that comes from childhood, Susanna Fritscher has made the instrument that she conceived and put it into one of the Sucrière’s silos. For her piece “Flügel, Klingen”, she could not have dreamt of a better location when the curator Emma Lavigne called upon her. The nine “sonic helixes”, to use the words of the artist and that are none other than white pipes, are on the scale of the architecture. The motor that runs them pulls out sounds that, strangely, go together. The sound that results from the piece is that of a drone that space stretches endlessly. Some will appreciate the ascensions towards high-pitched sounds, while others will prefer the descents that betray the end of sensory experiences that we would want to last longer. And the modification of our point of view inevitably influences our perception of this sound installation of obvious beauty. Let us move to a different silo in order to discover another sound work. Doug Aitken’s, “Sonic Fountain II”, is indeed a fountain where we immediately hear the sounds. The cracks of the circular basin’s borders filled with whitish water seem to have been sculpted by some forces of nature. 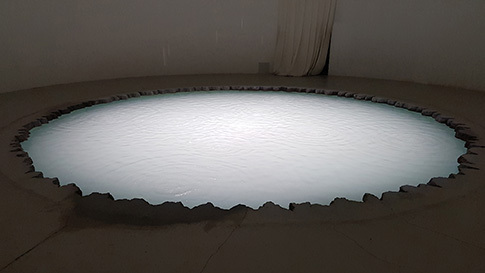 The drops of water are the ones which, released according to controlled temporalities, seem to extract the installation from the Sucrière where it is firmly anchored. Their notes, amplified and treated in real time, propel us into the depths of the earth that Jules Verne once imagined accessible, which the spelunkers will never contradict. As all the fountains in the world, it musicality appeases us, slowing our pace down. Without really being aware of where we are, we let ourselves be carried away by the American artist’s composition that is playing with our senses. Here, the act of closing our eyes has the effect of virtually making the silo’s space bigger. And nothing except the sound of a drop of water can affect us. If there are works that are able to temporarily extract us from the world, this piece is one of them. Moving to the first floor of the Sucrière allows us to discover some works of “mixed media”, such as the one entitled “Coloring the WiFi Network”. There is what we see and identify as a series of metallic sculptures, which are as slender as colorful. The three mobiles are in fact router antennas that no one notices, as these objects are now part of our technological daily life. However, these boxes are the ones which allow us to access the invisible part that gives the work its meaning. The role of the French artist consists in giving a shape, or more precisely to assign colors to the WiFi network of the antenna sculptures. 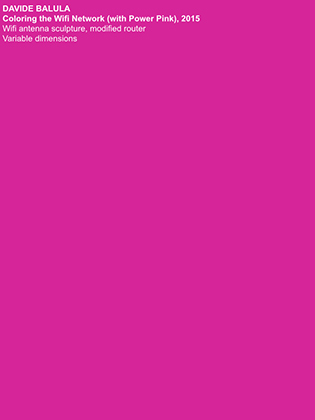 The audience is allowed to connect to the networks that give access to either white, pink or yellow monochromes. Nowadays, the invisible is where everything happens, from the frequency waves to the cloud. Is it not time to give it other shapes, going far beyond the brands’ pictograms? The same shapes that, when it comes to space and emptiness, could convey the sublime that the monochrome artists are already questioning. On the first floor of the Sucrière is another series of Dominique Blais, which is also built around the theme of monochrome. It is a set of four “paintings” that are not quite paintings; when put together under the name of “Empyrée”, they invite us to see some representations of celestial space. Although we could imagine them representing some expanses of water as well, because of their iridescent surfaces. They charm our retina and that is the reason why the artist has selected them at a materials manufacturer. By framing them, he makes us see them differently and it is where the magic of the museum context operates. The material, to which we would not usually pay attention, elsewhere and otherwise, incites us to reconsider it. We are expecting to see some skies or oceans going far beyond the frames that participate in the staging, which aims to making the ordinary beautiful. And the artist, in his way, has to uphold that all surfaces of the world, material or texture, may deserve to be paid attention to, even beyond the museum. 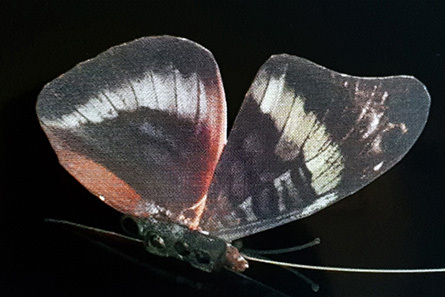 Finally, at the Museum of Contemporary Art of Lyon, there are some appearances such as the ones of artificial butterflies activated by Yuko Mohri. 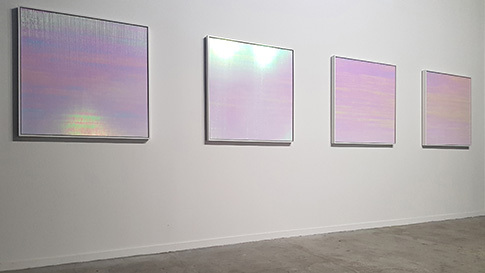 Her work entitled “Pleated image” is shown to the audience in the form of an installation with constantly renewed video images. And it is only after having crossed the wall to continue our visit that we finally understand the reason of their renewing. The apparatus is mechanically complex and some scanners are the ones which, automatically and according to seemingly random rhythms, activate in order to capture the butterflies. We then grasp that the database, which is heightened with every picture, is limitless. And we think about these artists practicing photography without cameras, from Man Ray or Moholy Nagy to Thomas Ruff. There is a certain roughness in the images of this Japanese artist. Applications and online services are attempting to suppress this coarseness. Her approach goes against the search of perfection in pictures, which we are too often forced to produce and appreciate. Written by Dominique Moulon for ETC Media and translated by Garance Moulon, October 2015.